Now some will undoubtedly be aghast that there might be a connection between the Battle of Britain and today’s Celebration of Teaching and Learning. Afterall, the Battle of Britain yielded thousands of lives lost but many more saved, acts of courage, the moral defense of freedom and the fight against tyranny. Certainly, the Battle of Britain defines a noble act. But we would be demoting our own profession – the education profession – if we did not put what we do into this same elite circle of noble acts.For while the Battle of Britain saved millions of lives and became a bright beacon for freedom fighters, we educators transform millions of lives and make it possible for enlightened citizens to articulate the right to freedom. Every year, RIT graduates more than 3,000 students – students who are now prepared to lead fulfilling and meaningful lives thanks to the work of the faculty and staff. These students will become scientists, engineers, artists, coders, designers, and educators and then go on to become leaders in industry, academia, government and in society as a whole. All possible because the faculty and staff have embraced the noble act of transforming lives.So yes educating students – the act of transforming lives - is companion to saving lives and fighting for what is right. 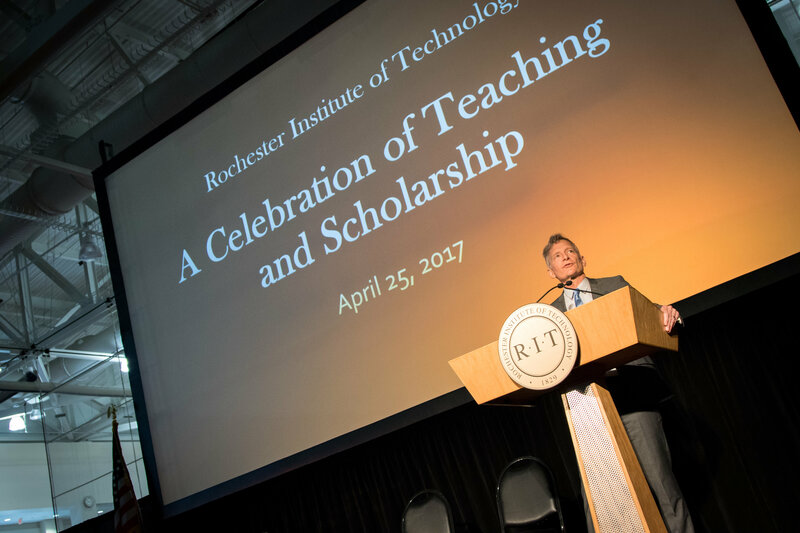 And it is therefore fitting and right to invite you to our finest hour – the celebration of teaching and learning at RIT.